You want to know more about Acetyl-L-Carnitine to see if it can help you solve memory problems, increase more blood flow in the brain, treat nerve pains caused by diabetes, or perhaps some other health issue you have heard it is able to handle, right? And you wish to know more about it to understand how it works and how well it can help with the health condition, isn’t it? Well, my Acetyl-L-Carnitine review will help you get the most important details about it like what it really is, how it works exactly, benefits, the right dosage, possible side effects, stacking, the best place to buy, my thoughts on it and even get personal customer reviews from people who have bought it before, to name a few. I believe this review will help you get enough information about the product so that you make your purchase with full knowledge of how to work it out and what to expect from it. And in case you want to know anything else about it that I may not have mentioned here, please feel very free to leave your comment below indicating your area of interest, and I will handle it soon as I get it. Okay? Also known by the name ALCAR, ALC or acteylcarnitine, this is a building block for proteins that is found naturally in the body. It is basically an amino acid that helps the body to produce energy for various functions. 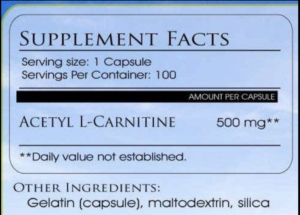 You will oftenly hear people saying it is an “acetylated form of L carnitine”. And while this may be a bit confusing to lay men like you and me, it simply means that the L carnitine amino acid has been bonded with an acetyl group to form Acetyl-L-Carnitine. And this acetyl group makes way for the amino acid to go through the barrier of the blood brain without problems, which comes with very many benefits. This product is well known for helping with weight loss and bodybuilding as it gives a hand with using the stored fat in the body as energy while working out. It is also commonly used to enhance cognitive abilities. To divert a bit from Acetyl-l-carnitine to its broader form, I would like us to take a look at the various forms of carnitine, which is part of what forms Acetyl-l-carnitine. L-Carnitine (a different type of carnitine) is the standard active form of carnitine which you will find naturally in your body, in most foods as well as in supplements. * Propionyl-L-carnitine – This is a type of carnitine that is known to help with blood related issues like blood pressure and peripheral vascular disease. It improves flow of blood by increasing the production of nitric oxide. * D-carnitine – This is a type of carnitine that prevents other more useful types from being absorbed into the body. It can cause carnitine deficiency in the body. * L-carnitine L-tartrate – This is another type that is mostly helpful in sports. It has a very high absorption rate that comes in handy in increasing recovery when doing exercises as well as helping with soreness of muscles. * L-Carnitine – This is a different type of carnitine which is the standard active form of carnitine which you will find naturally in your body, in most foods as well as in supplements. * Acetyl-L-Carnitine – This is the type we are focusing on within this post. It is known to have many benefits including brain related and health related benefits as we will be seeing in a few minutes. 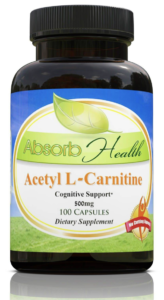 As stated earlier, the synthesis of Acetyl-L-Carnitine is what makes it able to go through the blood brain barrier easily and have it bring many health benefits in the brain. The combination of the acetyl group with the L carnitine makes it possess suitable characteristics like having a great bioavailability as well as quick and easy absorption into the digestive system. Acetyl-L-Carnitine also improves the rate of metabolism in the brain as it has anti oxidating effects that help fight off the cellular oxidation in there and thus reduce the number of cells getting destroyed by the oxidation. This is what makes ALCAR an effective solution to slowing the aging process. It is also known to increase energy in the cells, prevent brain degeneration when one is stressed out and protects the neuro system too. The acetyl group in Acetyl-L-Carnitine help with synthesis of acetylcholine which is a neurotransmitter that is actively involved with learning, focus and memory. And it helps produce more of this neurotransmitter which in turn enhances cognitive abilities. Low levels of acetylcholine bring the risk of suffering from Alzheimer’s and Parkinson’s disease. It has also been found to increase the production of serotonin and norepinephrine, which are other essential neurotransmitters involved in better brain function and mood enhancement. It is also known to complete the effect in racetams like Oxiracetam and Aniracetam, which are nootropics that hike the function of neurotransmitter receptors in the mind. It works on the myelin sheath which encloses the brain nerves. When myelin sheath is destroyed, abilities like vision, coordination, hearing and other important brain functions are impaired. ALCAR protects the sheath to avoid all these impairments from happening. It also helps keep the neurons working at their best by protecting the membrane signal receptors which also increases the capability of the brain to form and secure new memories. In many studies done on this supplement, results have shown that it has great abilities of reducing pain especially with people who have chronic neuropathic pain. This means it really brings down the pain that is associated with health conditions like HIV, diabetic neuropathy and compression together with injury. It helps to reduce the disorders that come with old age. Disorders like memory loss and Alzheimer’s are handled pretty well by it. This supplement has been appreciated by almost all of the users. I looked through the customer reviews of it and the majority of the users gave it a 5 star rating and a 4 star rating. I did not see any poor ratings which means it is doing a pretty good job. So it is something you want to work with. Although you should be careful with the way you use it. I always recommend checking first with your doctor so that you know if it is a good fit for you and how to use it based on your specific health status. I think I have mentioned a lot of techy terms that I might have missed mentioning the benefits clearly. And if you are the kind of folks who like listed benefits like me, then this one will prove to be helpful. It is also believed to treat these problems too, although there is little proof for it. Well, the dose you should take pretty much depends on what condition you are taking it for. You take it by mouth. • If you have diabetic neuropathy, you should have 1500mg to 3000mg a day but divided into 2 to 3 doses. • If you have elderly depression, you should have 1500mg to 3000mg each day in 2 to 3 doses per day. • If you have Alzheimer’s disease, you should have 1500mg to 4000mg in divided doses. • If you have peyronie’s disease, you should have 1 gram twice per day for at least 3 months. • If you have memory loss due to age, you should have 1500mg to 2000mg per day. • If you have male impotence (“menopause”), you should have 2 grams of Acetyl-L-Carnitine together with 2 grams of propionil-L-carnitine per day. As I had ealrier mentioned, Acetyl-l-carinitine increases the effectiveness of racetams, so it would be a really good idea to stack it with them to increase the effects you get and the efficiency of the nootropics. Also, it does a pretty good job with the acetylcholine system which means getting a choline forerunner in the stack such as Alpha GPC would be all the more benefiting to your system. You should have this stack together once per day. You can also stack it with Mind Lab Pro, another great nootropic that improves your moods, mental performance, brain repair and memory. It has more than 10 well known ingredients that are popular with increasing mental abilities. You should have these two supplements once or twice a day. Generally, Acetyl-L-Carnitine is safe for almost all adults. There are mild side effects that are sometimes seen like nausea, mild stomach ache, vomiting and uneasiness. The best way to ensure that you are personally safe to take it is to check with your doctor first. The best place to get acetyl-l-carnitine at a cheap price is AbsorbYourHealth.com. This is by far the best place I know that sells good quality stuff. And it has actually grown to be quite reputable within the nootropics industry. It is one of the few places you will get most of the popularly powerful brain supplements like adrafinil sold, and at great prices with great discounts, especially when you buy in bulk. It is my go to store whenever I want to get any mind power supplement. You should consider buying regularly from them too. I have also seen it’s what most people on reddit use too. It is a really great store! I also recommend buying from www.amazon.com since it has the same brand of this supplement. But do note that it will be slightly expensive on amazon than on the main website. I encourage people to buy it from amazon if they were planning to shop for more stuff from the online store. With a supplement like this, you are able to fight most brain related issues as well as improve the health of your body. Also, considering that it helps increase the efficiency of other supplements and works together in a stack, it is something you want to consider when you think about handling age related problems and improving your brain and body health. I highly recommend you give it a go. Again, if you have any burning questions about Acetyl-L-Carnitine or any other brain power question, just drop your comment below and I will be more than happy to help you out. I’m very interested in L-carnitine and was glad I came across this article talking about the benefits and explaining how it works. I understand that because it’s simply an amino acid that it had fewer side effects than some other supplements/nutritional products. I am gonna try it because it seems like it is beneficial, especially for folks like me who are not 20 anymore. I saw a reference to Alzheimer’s and how it protects the sheath that encloses the brain nerves. I guess it helps with Alzheimer’s. I assume it does because of all the other brain functions it seems to improve. I benefited from the video as sometimes it’s easier to hear and see someone talk about a subject that is not always easily understandable. that helped. thanks for the review. It helped me decide to add it to my regimen. I’m glad you loved the review. About alcar treating Alzheimer’s disease, there are no studies that have proven that it completely treats Alzheimer’s or Parkinson’s disease, but there is sufficient evidence that it helps delay the onset of the disease. But if you have already been found suffering from it, the supplement will help slow its development and keep you brain functioning elevated. Ideally, I would say this makes a great supplement for people who are suspecting that they might be suffering from Alzheimer’s or those that have already been diagnosed with it and are in their early stages of it. I was getting all excited reading your information until I got to the part about hypothyroidism and not taking it if you have it. Why is that? What are the issues if you take this supplement and have hypothryroidism? I would be really curious to know since I have it. Am I doomed on my brain power because of it? Thanks for a great article. The reason I advise people not to take alcar if they have hypothyroidism is because it comes with disturbing stomach issues and other effects as well depending on other conditions you may be suffering from. You may not notice the moment you take it, but you will feel it a while later. And yes, it’s something you don’t want to experience with this condition. Although some people say that taking it on the short term can help and keep the stomach effects away, but I would rather you don’t test the waters. The supplements I would advise you use if you have hypothyroidism is Zinc, Vitamin A, Iron and B Vitamins. Tyrosine and ashwagandha are also great because they make the ingredients of most brain power supplements. Thanks for very comprehensive and honest review of Acetyl-L-Carnitine. Actually, I hardly believe on so widespread online men erection wonder pills but this could be an exception. Need to check in the local pharmacy luckily you stated ingredients as I think that in Latvian market these pills could have another name. This supplement is not one of the those hyped up pills you get on male enhancement. They are an improved version of the ingredients people have used for years.